Infants born before the 37th week of pregnancy are said to be premature or preterm and face increased risk for a variety of complications. Babies born before the 28th week of pregnancy—more than 30,000 per year in the United States—are particularly vulnerable to breathing problems such as respiratory distress syndrome and respiratory failure due to their underdeveloped lungs. These infants often need respiratory support in the first days and weeks after birth. Those premature infants who still require supplemental oxygen 36 weeks after conception are diagnosed with bronchopulmonary dysplasia, which places them at greater risk for death or problems with long-term lung health, brain development, and brain function. Nitric oxide is a chemical compound in gas form that is sometimes used to treat infants with severe breathing problems. 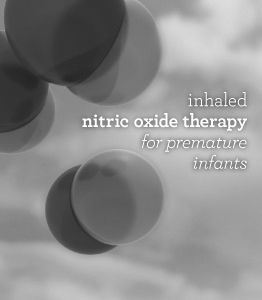 Inhaled nitric oxide therapy was approved by the U.S. Food and Drug Administration in 2000 to treat term and near-term infants (born after the 33rd week of pregnancy) with respiratory failure. Inhaled nitric oxide therapy is typically administered in the neonatal intensive care unit using a device that delivers the drug in constant concentrations. It acts as a pulmonary vasodilator, widening the opening of blood vessels in the lungs. In term and near-term infants, use of this therapy may shorten the length of time respiratory support is required, thereby reducing progression to bronchopulmonary dysplasia, improving long-term lung health and brain development and function. Since its approval, researchers have examined expanding the use of inhaled nitric oxide therapy to treat premature babies born at less than 34 weeks gestation. Studies to evaluate its safety and efficacy for these infants have had mixed results in terms of key outcomes. Thus, the potential benefits and harms of its use for premature infants with varying degrees of respiratory illness are not completely understood. The conference is presented by the Eunice Kennedy Shriver National Institute of Child Health and Human Development and the Office of Medical Applications of Research, with additional support from the National Heart, Lung, and Blood Institute. Invited experts will present scientific evidence pertinent to the posed questions and a systematic literature review prepared under contract with the Agency for Healthcare Research and Quality will be summarized. Conference attendees will have opportunities to ask questions and provide comments during open discussion periods. After weighing the scientific evidence, an unbiased, independent panel will prepare and present a consensus statement addressing the key conference questions. I. Does inhaled nitric oxide therapy increase survival and/or reduce the occurrence or severity of bronchopulmonary dysplasia (BPD) among premature infants who receive respiratory support? II. Are there short-term risks of inhaled nitric oxide therapy among premature infants who receive respiratory support? III. Are there effects of inhaled nitric oxide therapy on long-term pulmonary and/or neurodevelopmental outcomes among premature infants who receive respiratory support? 9:30 a.m. Evidence-based Practice Center Presentation II: Does This Therapy Influence Long-Term Pulmonary and/or Neurodevelopmental Outcomes When Used in Preterm Neonates Requiring Respiratory Support? 10:50 a.m. Does the Effect of Inhaled Nitric Oxide on Bronchopulmonary Dysplasia (BPD), Death, or Neurodevelopmental Impairment Vary Across Subpopulations of Premature Infants? V. Does the effect of inhaled nitric oxide therapy on bronchopulmonary dysplasia (BPD) and/or death or neurodevelopmental impairment vary by timing of initiation, mode of delivery, dose and duration, or concurrent therapies?